AIZAWL/AGARTALA/IMPHAL, Feb 12: Massive demonstrations and protest rallies were held in Mizoram and Tripura on Tuesday against the Citizenship (Amendment) Bill, 2016, while in Manipur, the authorities imposed indefinite curfew in Imphal East and Imphal West districts in view of the continued protests. In MNF-ruled Mizoram, the powerful NGO Coordination Committee organised spirited demonstrations in Aizawl and seven other district headquarters to protest against the controversial Bill. Thousands of people took part in these rallies holding placards and black flags. Even though ‘Hello China, Bye Bye India’ placards were missing this time, they were replaced by anti-India placards like ‘Welcome Independent Republic of Mizoram’, ‘Hello New Christian Country’, ‘Welcome Independence’. 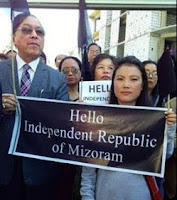 Former Mizoram Chief Minister Lal Thanhawla, too, joined the protest in Aizawl and was seen holding a ‘Hello Independent Republic of Mizoram’. Leaders of all the constituent organisations delivered speeches during the protest rally. Protest rallies were also held in BJP-ruled Tripura over the same issue. Police said no untoward incidents were reported from any of these two northeastern states. Prohibitory orders under Section 144 CrPC were imposed last night in two Manipur districts. Even as the protest got intensified, the administration clamped curfew in Imphal as a pre-emptive move to maintain the situation. However, people defied curfew and staged protests against the Bill. The administration also suspended mobile internet services, while security has been strengthened in the residences of MLAs and ministers, including that of Chief Minister N Biren Singh, officials said. In Aizawl, NGO Coordination Committee chairman Vanlalruata said that despite the protest from almost all political parties and NGOs in the entire northeastern region and other parts of the country, the Union government is keen to pass the contentious Bill even in Rajya Sabha. He urged the people to come forward in large numbers in protest against the Bill that is against the interests of indigenous people of the Northeast. Special mass prayers are being held in many churches in Mizoram since Saturday for the defeat of the Citizenship (Amendment) Bill in the Upper House of Parliament. The ruling MNF in the state also has been demanding of the Centre to withdraw the Bill. Protest rallies, spearheaded by newly-formed Movement Against Citizenship (Amendment) Bill (MACAB), were also held in some tribal-dominated areas of Tripura on Tuesday. The main protest rally was held at Jampuijala in Sepahijala district. The MACAB is a conglomerate of several NGOs and four tribal-based parties, including Tripura’s oldest tribal party Indigenous Nationalist Party of Tripura (INPT). The Congress is also backing the MACAB.